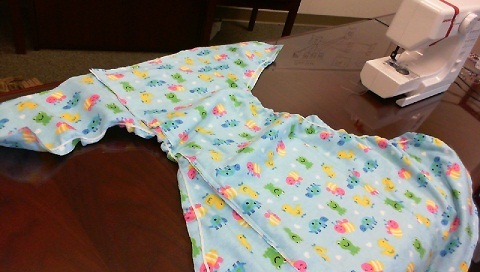 Making your own custom fitted cloth diapers can be a rewarding experience. In addition to saving you money, it can also allow you to own a superior product that is perfectly fitted to your own body and tailored to the absorbency you need. 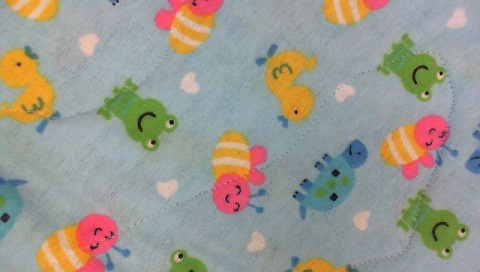 Approximately 2 yards/meters of cotton flannel per cloth diaper, although this can vary depending on your size and the amount of absorbency you require. Buying too much is better than buying too little. 2 yards/meters of elastic. There are many kind of elastic available. I typically use something like 1/4" braided elastic. You will probably have some left over. A spool of thread. Standard sewing machine thread should work fine. A sewing machine. I wouldn't attempt this project by hand because the amount of time it would take would negate any cost savings. The sewing machine doesn't have to be fancy or expensive but shouldn't be a $30 hobby machine either because those won't be able to handle the thickness of what is being sewn in this project. The least expensive option that will still work would be something like the Janome Sew Mini (which was used in the making of this article), which is a real sewing machine that can be had for as little as $50. At a minimum, you will need a machine that can go forwards and backwards, supports a variety of stitches, and can sew through a minimum of 6 layers of cotton. Fastener method of choice. This could be something like velcro or diaper pins. The first step in making your own custom fit diapers is to create your own design. While this can sound daunting, it is actually a really fun part of the process and allows you to get exactly what you desire. It will feel more rewarding in the end if the proper time is spent at the beginning producing your own design. To get started with a design you will need measuring tape, graph paper, scissors, a pen or pencil, and scotch tape. The circumference of your leg, at the point where you want the leg opening of your diaper to be. This will be called measurement 'A'. The circumference of your waist or hips, whichever is greater. This is measurement 'B'. The measurement starting at where you want the top of the front of diaper to rest heading down under your legs and up your back to the point where you want the top of the back of the diaper to rest (so front of waist, under crotch to back of waist). 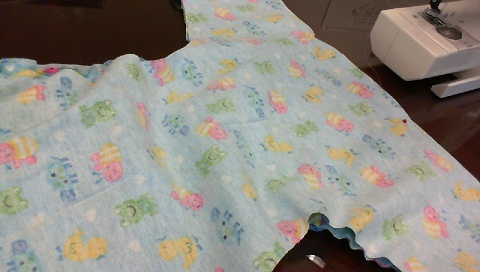 This will be the length of the diaper and you should add a little extra to account for the bulk of the diaper. This is measurement 'C'. The measurement starting at where you want the top edge of the diaper to rest on your side and ending at the point straight down where you want the bottom edge (leg opening) to be on the same side. This is measurement 'D'. One final measurement will need to be determined and that is the width of the narrowest part of the diaper which falls right between your legs. This measurement is largely determined by personal preference and will need to vary depending on how much absorbency or extra padding (like cloth doublers) are needed and what the limits of your preferred diaper cover are. This measurement should be less than the width of the same area of your diaper cover or else it will leak. This is measurement 'E'. It is far easier and cheaper to make mistakes on paper than to make mistakes on fabric. Using your graph paper, draw out several design ideas scaled to your measurements and then cut them out and tape them together as you would fasten a diaper. The most basic shape could be a simple hourglass type shape where the front and back are essentially the same (see Figure 1). However, this shape will leave the leg openings to the side, not give very full coverage on the back, and have a less than ideal waist line. A slightly more fitted shape could have a gradual taper from the back to the narrowest point and then turn more sharply out on the front (see Figure 2). By altering the shape of the leg opening, the leg opening moves forward and gives fuller coverage in the back. Experiment with different shapes of leg openings until you find the one you like. Creating a slight taper on the front and back edge can give a more comfortable waist fit as demonstrated in Figure 2. Keep in mind that the front and back will overlap when fastening so give extra room to account for this. As an example, I have a 36" waist and added 6 extra inches to the total width account for overlap. My top front and back edges measure 24" each (1/2 of 36" + 6). The front and back wing flaps, at the point where they meet and overlap, should have the same dimension (measurement 'D'). If you are unsure if your design will work, scale it up to full size on large paper or plastic sheeting and cut it out. Tape it on yourself and try it out! It should be a little bit roomy since things will shrink a bit once it is all sewn together and washed. Once you have a satisfactory design, it is time to build a cardboard template. Although having a template is not strictly necessary, it makes the process much easier and less error prone. 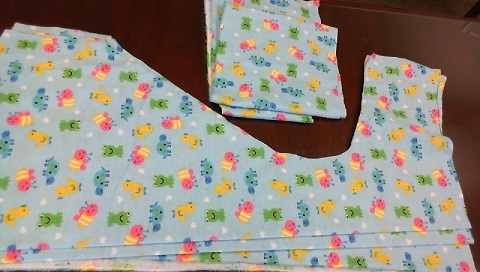 Templates can be reused again and again to make as many cloth diapers as you want and can also be used as the basis of creating other projects such as diaper coverings. For my template I used cardboard that I cut out from a large box, although other rigid materials may work just as well. The template is actually a half-template. This means that it should look like your design if you were to fold it in half lengthwise. Carefully scale up half of your graph paper drawing onto the cardboard so it is full size. In my design drawings, I used a scale of 1/4" = 2" meaning that every quarter inch square of graph paper represents 2". To make it easier, you could draw long straight lines on the cardboard making it look like big graph paper and then carefully copy the design from your graph paper. In my case, I would want to use a 2" x 2" grid of lines since my scale is 1/4" = 2". Once your drawing is transferred, cut it out. Up until this point you have been doing one-time design work that can be reused over and over. The following steps can be completed in one to two hours depending on your level of skill and the speed of your sewing machine. It is assumed that you have some very basic knowledge of how to use a sewing machine. Nothing in this section is requires advanced skills but you should know how to thread your machine, wind bobbin thread, change stitch types, etc. These steps should be repeated once for each diaper you make. Lay out your fabric on large, clean table. The fabric should have come folded in half. If it didn't, fold it in half lengthwise. The length should be at least equal to your 2 times your 'C' measurement, plus a little extra. There must be enough to cut out two exact copies of your template, and the majority of the remainder will get turned into extra padding. Again, I should stress that having too much fabric is better than having too little. Situate your template in the corner of your fabric with the long straight edge of the template lining up against the folded edge of the fabric (see Figure 3). 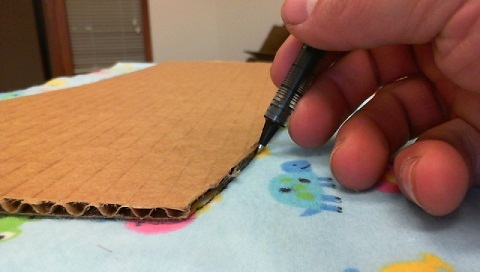 Using a pen that can easily mark fabric, draw the outline of your template onto the fabric (see Figure 4). Then move your template down the fabric further, keeping the long edge against the fold, and mark out a second copy of your template (see Figure 5). The two marked out areas should be right up against one another. 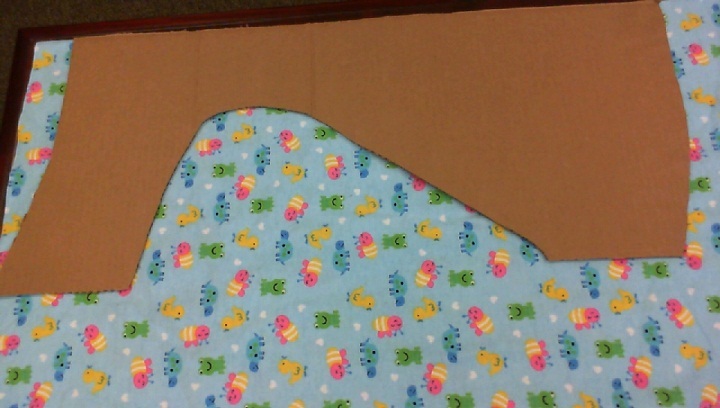 Carefully cut out the fabric along the marked lines and then unfold the cut out portions. They should closely resemble the original design that you made on graph paper. Cut out more fabric to act as padding. See if there is any room left on the remaining fabric to get one more template's worth cut out (Figure 6). In this case it doesn't have to be against an edge since it is going to go on the inside and can thus be in two pieces. You may also find some long wide strips of fabric in the left over material to use as padding. You aren't going to want too many total layers of fabric as it can be more difficult to sew and quilt and more layers increases the time required to dry the diaper after washing. Limiting the number of total layers, including the inside surface and outside surface, to something between 5 and 8 is reasonable. If extra padding is needed, booster pad inserts can be made from left over material. Lay out one of the two sides facing down and put a layer of padding material on it (Figure 8). You will want to sew on the largest pieces first so if you have a few pieces that are template shaped and a few pieces that are rectangular, attach the template shaped pieces first. Padding will be sewn in place one layer at a time. Place pins around the edges of the padding and through the downward facing outer side (Figure 9). These pins can be placed every 6 inches to make sure that the fabric stays in place while sewing and should be removed as you sew. 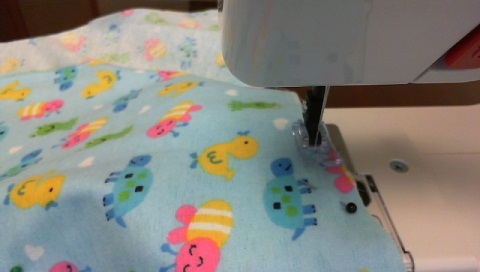 Set your sewing machine to use a long straight stich and sew around the perimeter of the padding, about a quarter to half inch from the edge (Figure 10). When you start or stop sewing, briefly reverse the stitch direction and then go forward again to make sure the end of the stitching doesn't unravel. Repeat the process for the remainder of your padding. If you like elastic around your leg openings, sew it on now. Some people use special sewing machine attachments to sew on elastic but it can also be easily sewed on without attachments with a little practice. You will want to cut the elastic shorter than the leg opening and stretch it as you are sewing so that it provides a snug fit when worn. I start by anchoring the elastic at one end of the leg opening, not quite to the portion that will overlap when wearing, by going forward and backward over about 1/2" of the elastic without putting any tension on it (Figure 12). Then pull the elastic adding tension and slowly stitch a straight stitch down the length of the elastic keeping the placement of the elastic at least 1/2" from the edge of the fabric. This extra clearance is necessary because the whole thing will be turned inside out after attaching the other outside face. This is not an exact science and may take a bit of practice. If you are unsure of this step, practice attaching elastic on some scrap fabric to see how much tension is necessary to get the end result you are looking for. Go slow. Flip over the diaper so the initial outside face is facing up and the padding is facing down. Then carefully place and line up the other outside face so that the pattern is facing downwards and the non-printed side is facing up (Figure 14). The idea is to stitch the outside faces together and then turn the entire thing inside-out so that the padding ends up on the inside. 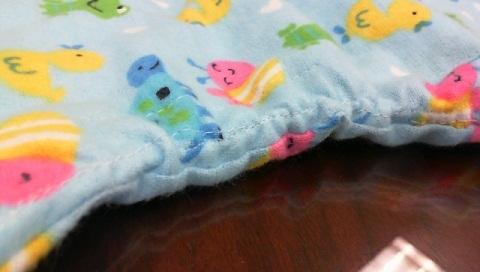 Pin around the perimeter of the diaper so that it stays together while sewing. Sew around the perimeter using a straight stitch being careful to stay to the outside of the elastic while still remaining about 1/4" from the edge. Leave about 6 inches in the center of the back top edge unsewn so that you can turn it inside out. Once the stitching is complete, reach into the opening you left and start to turn it inside out (Figure 15). Once inside-out, carefully inspect the edges for mistakes. 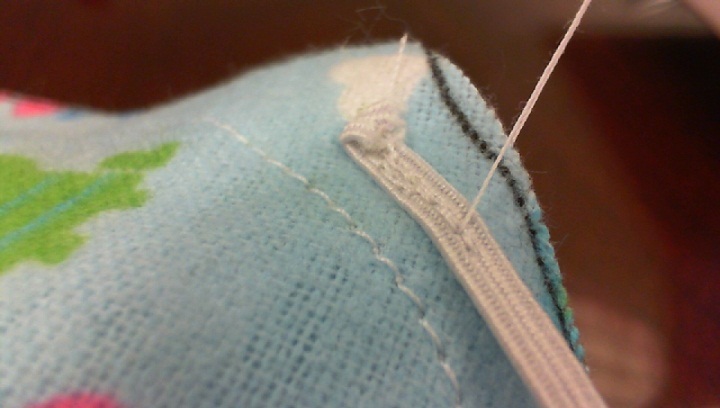 If there are any areas with missing stitches, you can turn it inside-out again and correct the stitching. Once you are satisfied, fold in a little around the opening you left and stitch over it to close it up (Figure 17). Quilting is the process of adding somewhat random stitching across the surface of the diaper which will increase the absorbency. After multiple washings, the quilting creates pockets that better absorb fluids. Absorbency of a quilted diaper should improve each washing for the first 5 or 6 washings. Quilting can be done by hand or machine. While quilting is easier by machine, you should first make sure your machine can handle sewing through the thickness of all of your layers. 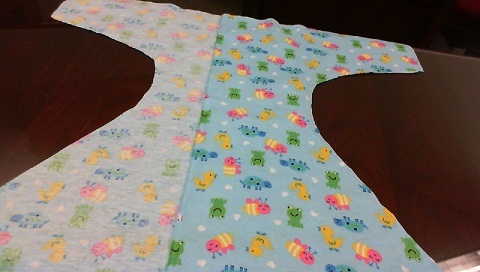 Make sure your quilting covers all portions of the diaper including the side wings. It doesn't have to follow any particular pattern and can randomly go anywhere. An example is shown in the figure below. At this point you have a completed diaper except for the final fasteners. 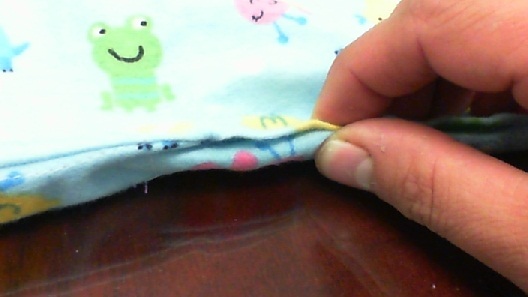 If you are going to fasten using diaper pins, you have nothing left to do but trim off excess thread and wash it. If you are going to use a fastener such as Velcro, it is best to wash the diaper first so that any shrinking will occur before you do your final fitting. To determine where to place fasteners, put the diaper on and hold it in place while you put pins in to mark the perimeter of where the front and back wings overlap. 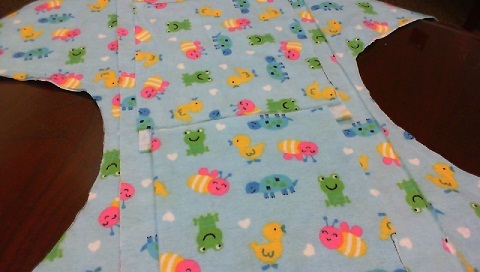 Take the diaper off and attach the fasteners according to the manufacturer's directions. If you are using a Velcro-type product, I recommend you get a wide product (1" or greater) of the sew-on variety and use multiple rows of it under the flaps that overlap. That will give the diaper a strong bond and allow you to move freely without worrying about it coming undone. I do not recommend using snaps as fastener due to the thickness of the material. 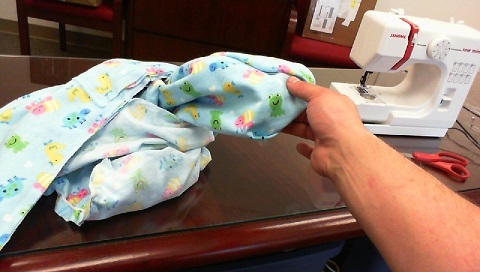 This is only an example of one method that can be used in making your own custom cloth diapers. Other techniques and materials have been used by many people with satisfying results. Wear your new cloth diaper for a period of time and note what you like and don't like about it. Perhaps the fit could be slightly improved, or you want to try a different amount of padding, or different fasteners. Incorporate these ideas into your next diaper and you will eventually have something that is really perfect for you. Even if you need to purchase a sewing machine, the long term cost difference and added comfort will easily outweigh the cost when you consider that making your own diaper can cost less than $15 when compared to the $50+ it costs to purchase custom sized cloth diapers from a retailer.